Topics: Learning Some Basic Computer Programs, Tweet This, and Thank Goodness For Colored Copiers. It is hosted by Glr Sales Llc Montevideo, using Apache/1 web server. It has 3 DNS records, ns1.loszona.com, ns2.loszona.com, and ns3.loszona.com. 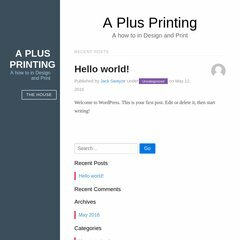 A-plus-printing.com's server IP number is 174.142.28.162. PING www. (174.142.28.162) 56(84) bytes of data. A ping to the server is timed at 41.5 ms, and the average page load time is 1860 milliseconds.